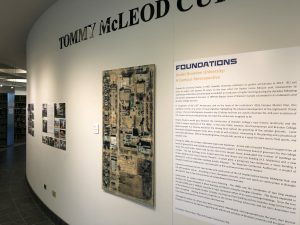 A new exhibition in the Tommy McLeod Gallery showcases decades of change — and proposed change — at Brandon University. BRANDON – The transformative growth and development of the Brandon University campus is on full display in a new, free exhibition in the Tommy McLeod Curve Gallery, on second floor of BU’s John E. Robbins Library. 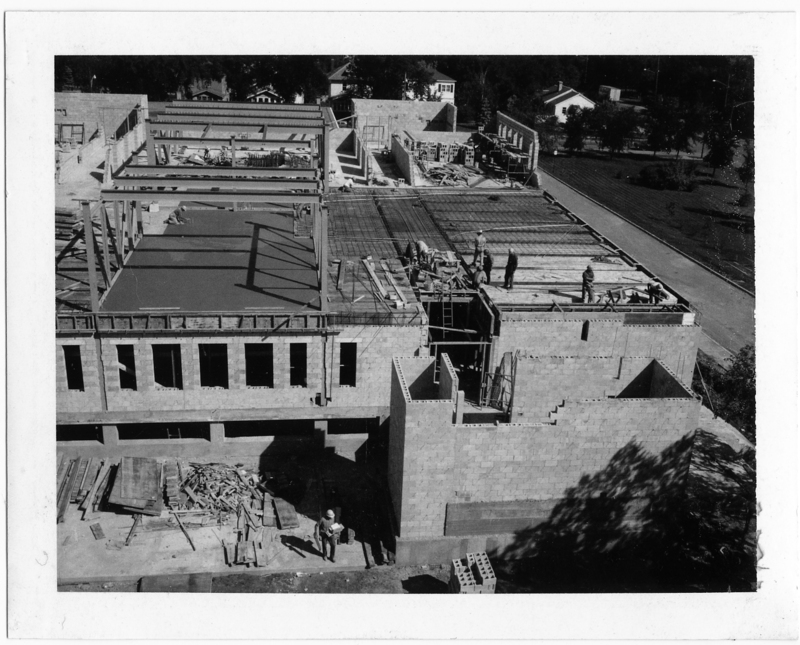 The Education Building under construction in 1966. The exhibition, called “Foundations Under Brandon University: A Campus Retrospective,” consists of a series of visual vignettes that highlight the physical development of the Eighteenth Street campus. The unveiling the exhibition is perfectly timed, as the institution celebrates its 50th anniversary as a university and as it also enters an ambitious new era of growth, with a transformative downtown initiative and a fresh Campus Master Plan. Plans and photographs housed in the SJ McKee Archives illustrate both the 118-year evolution of the campus and also contrast with drawings of what the campus was imagined to be. 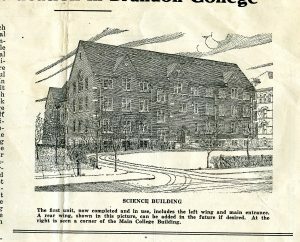 A drawing of the original proposed Citizens’ Science Building, as published in the Western Baptist XVI No. 4, in 1923. Brandon College never had enough money to complete the building as planned. One wing is now occupied by the Brandon University Students’ Union. One plan, for example, showcases a possible late-1960s campus redevelopment that would have sent the historic Brandon College original building and attached Clark Hall to the wrecking ball, replaced with a concrete plaza between squat new square buildings. Others showcase proposed developments that end up being similar, but different, to the way they were actually built. Many other of the displays chronicle the actual construction of different buildings, exploring how they have changed and expanded the architectural heritage of Brandon University. 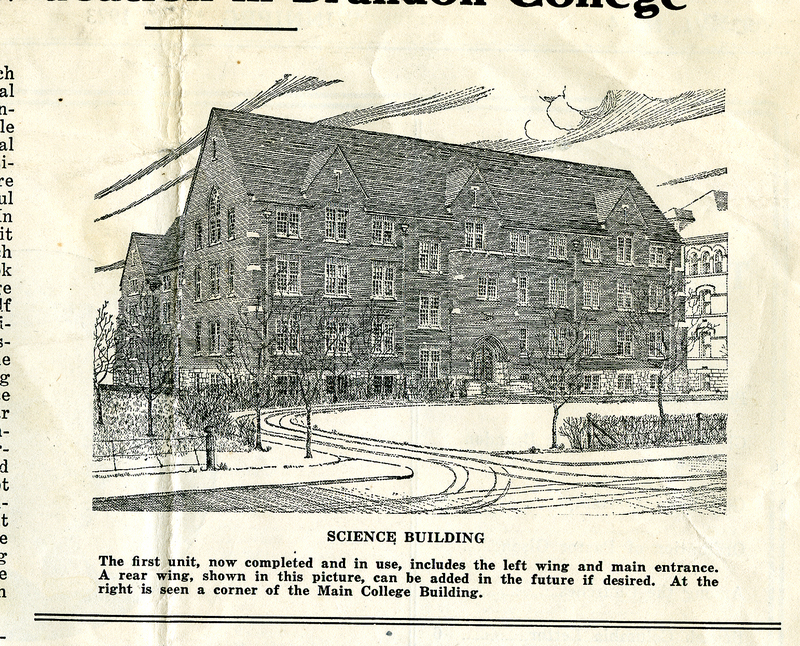 The first buildings on campus were the original Brandon College building, and then the attached Clark Hall, originally a women’s residence. A nearby science building, which now houses the students’ union, was next. Originally intended to be up to three times its current size, wars and a recession in the early 1900s would tamp further expansion of the campus for decades. 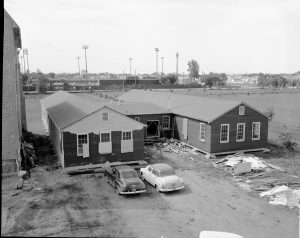 H-Huts under construction in the mid 1950s. They were located west of the Citizens’ Science Building (BUSU) and were demolished in 2010. Nearly 40 years would pass between that first wave of construction of Brandon College’s now-historic landmarks and a more modern campus expansion in the 1960s. In the early 1950s, however, local businessman and Brandon College Board member P.A. Kenney would be the driving force behind the grooming of the campus grounds. Local businesses donated evergreen trees, elms, shrubs as well as labour, culminating in the planting and cultivation of more than 600 plants. Before the building boom, the grounds served as a space for lawn tennis, field sports, and outdoor rinks. During the 1960s, the campus underwent large-scale expansion. Armed with increased financial support from all levels of government and backed by strong community support, a determined board of governors for the college drove the construction boom that by the end of the decade nearly quadrupled the number of buildings on campus. The first buildings to be funded were the new library and arts building (A.E. McKenzie) and a new lecture theatre (J.R.C. Evans Lecture Theatre). A steam plant, a dining hall, two residences, a music building, a gymnasium, and an education building quickly followed. The Westman Centennial Auditorium, a project of Canada’s Centennial celebrations, was also built on the southwest corner of the campus. Expansion continued into the next decade with construction of the J.R. Brodie Science Centre, McMaster Hall, and the Jeff Umphrey Centre. According to local newspaper accounts, more was spent on construction in Brandon during 1971 than in the entire province of Saskatchewan that same year. Construction on campus slowed in the years following. The 1980s saw the completion of two long-awaited facilities: the Queen Elizabeth II Music Building and BUSU’s Knowles Douglas Complex. The library expanded in the early 1990s and in 1996 BU launched a major restoration effort of its iconic heritage buildings. Since the turn of the millennium, the Health Studies Complex, the Physical Plant Building and the Healthy Living Centre have all been completed. Moving forward, properties at the former Fleming School site and the city’s downtown core have been earmarked for future campus development. Although the spaces on campus have been renovated, redeveloped, and repurposed over the years, their physical footprints remain the foundation supporting the efforts and activities of Brandon University and its community. A closer look at the display. “Foundations Under Brandon University: A Campus Retrospective,” will be on display until the end of April 2018. The Tommy McLeod Curve Gallery is located on second floor of BU’s John E. Robbins Library, and is free to the public during regular library hours. An exhibition of this size and scope requires assistance from a number of people. Funding for the project was provided by University Librarian Betty Braaksma, while University employees Rick Smith, Kevin Morrice, Trudy Bourgeois and Morganna Malyon helped with the installation. Pieces for exhibition were printed by Lasting Image, Leech Printing and Accent Custom Cresting, while others have been graciously loaned to the curators from private collections. In particular, Henry and Tsukamoto thank Ben Davis, Barb Flemington, Curt Shoultz, Sandy Black and BUSU for allowing the display of their work.